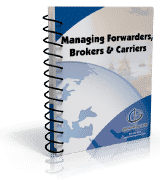 Global Training Center’s “Managing Forwarders, Brokers & Carriers” was written by George W. Thompson and Catherine J. Petersen. Mr. Thompson specializes in export and import regulation and international business counseling, such as antidumping, countervailing duty and other trade remedies, Customs compliance, export controls, international sales contracts, and administrative and judicial litigation relating to these matters. Mr. Thompson has advised domestic and foreign corporations in myriad industries, including food and agriculture, automotive, furniture, software, chemicals, electronics, office and telecommunications products, aerospace, and consumer goods. Ms. Petersen is a sought-after speaker and instructor both here and abroad. She has designed export documentation and procedure manuals for firms of all sizes, including several Fortune 500 companies. She has authored or co-authored five highly regarded books used by businesses, technical institutes and universities covering Incoterms®, logistics, supply chain, and documentation. She holds both graduate and undergraduate degrees in regional planning from Mankato State University, Minnesota, and is a Licensed Customs Broker. Ms. Peterson’s trade books can be found here at GTC.